Zephyr is a flow-pack servo assisted horizontal wrapping machine for producing wraps hermetically sealed on three sides from a reel of heat-seal wrapping material. The machine has been designed with cantilevered main frame and matched perfectly to a series of automatic feeding systems. Ideal for medium speed packaging. Cantilevered machine construction; the mechanical and electrical components are housed separately at the back of the machine, while the front is free from obstruction and thus quick and easy to clean in every point, visible or hidden. Fully cantilivered frame with separation plate. 4 finwheel units (i.e. cold, two heated, fold-over). Diplay on machine staus, diagnagnostic, production data and alarms. Chain with cantilivered pusher fitting. Complete series of infeed conveyors. Mechanical or air gussting device. 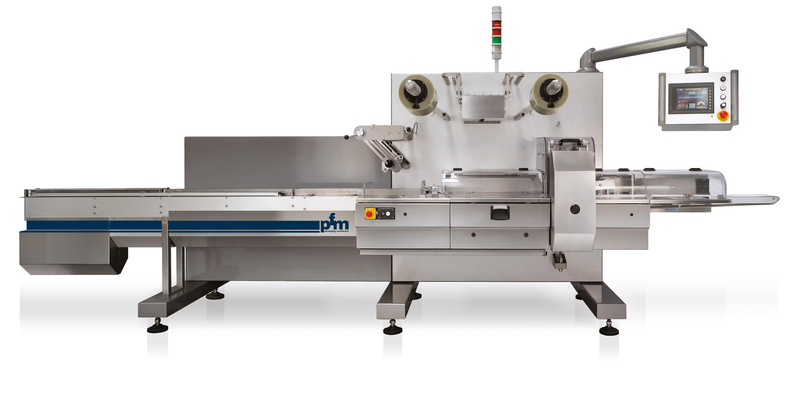 PFM Zephyr is a flow-pack servo assisted horizontal wrapping machine. In the video you can see a Zephyr LD packaging line for Soap Bars.